I was doing some reading the other day on one of the social media sites, I think it was Pinterest. There, I came across a discussion about IPE, wherein the group was discussing the challenges of making oils work in IPE. This is a classic IPE myth. And, it is one of the things that makes the internet a two edged sword. It is easy for one person to conclude based on their own (potentially flawed) experience that something can or cannot be done. Then, the world of internet surfers skim through it and accept the information as correct. If oil doesn’t penetrate ipe, how do we explain this? Sure, there are times when it is difficult to induce IPE to take oil. One of the most difficult times is when IPE is new. That is when the natural oils are most present, and least weathered by the elements. As we have discussed on this site, the initial coating has to be just right. The other time that it is difficult is on maintenance coats. More specifically, when the surface is not properly prepared (through either chemical washing or sanding), it can be very difficult to get oil into IPE. However, these situations don’t point to the definitive conclusion that oil just doesn’t penetrate IPE. 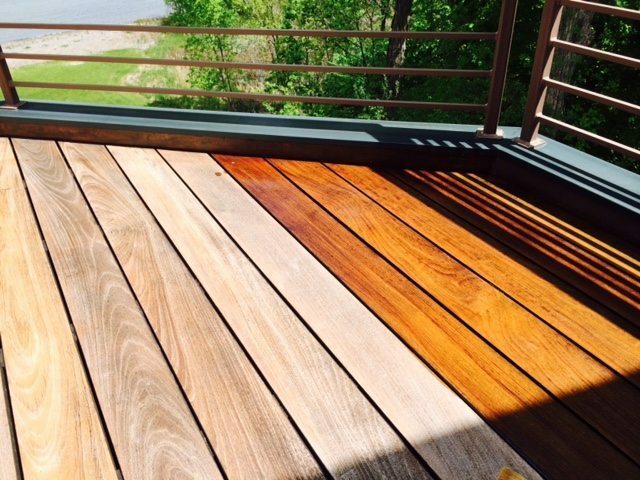 There is no doubt, it is more difficult to achieve oil penetration in IPE than in most wood decking species. And, sure, it is human nature to avoid things that are hard to do. But, that doesn’t make it impossible. Just more rewarding for those of us who take the time to understand. About the Author: Scott Burt is a wood finishing expert. IPE decks are one of the areas of expertise in which he is frequently published in paint and remodeling magazines. He also engages in clinics and speaking appearances on the topic. Ipehelp.com is where IPE owners and installers can engage with Scott. More from this author. Join us across the web. IPE Advice: The Worst Things in Life are Free Too. © 2019 IPE Help. All rights reserved. Theme by Solostream.